The logo of your company/organisation will be placed on the first page of the program folder. The positioning will be done by the organizer. Size due to positioning needs. A preliminary draft version of the program will be announced globally by e-mail about five months before the respective event. Updated versions of the preliminary program/invitation and announcements will be circulated worldwide by e-mail several times before the event (at least twice). The logo of your company/organisation will be placed on this mailing together with a hyperlink to the website of your company/organisation. There will be a specific conference web page established five months in advance to the conference at the latest where all information concerning the upcoming conference e.g. program, hotel information, registration details etc. will be available. This web page will exist until the day of the conference. The logo of your company/organisation will be placed on this website together with a hyperlink to the website of your company/organisation. The logo of your company/organisation will be placed in the leader of ChemCon TV (news bulletins and interviews). 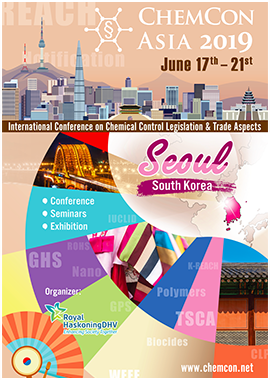 ChemCon TV enables us to share information of ChemCon Asia 2019 with our delegates in Seoul as well as our total network. Placement of your advertising material at the registration desk during check in and on a special desk situated in the exhibition and break area, so that it is visible during the whole conference and can be picked up at any time. Materials have to be sent to the respective venue. Contact details will be provided. After the conference a post-conference web page with all the papers and presentations given at the conference will be established to enable delegates to download or print them. Also a selection of pictures taken at the conference will be provided. Your company/organisation logo will be placed on this website as well. A USB drive including an electronic handbook will be prepared and given to all delegates after the conference. The logo of your company/organisation will be placed on the USB drive. A certain number of copies of the USB drive will be delivered to your company/organisation free of charge for individual distribution. Furthermore, this electronic handbook will be distributed to all experts, competent authorities, associations and non governmental organisations around the globe, which show interest in these topics and order a copy. Are encouraged to bring in ideas or wishes during the preparation of the conference. Have the opportunity to include several PDF-leaflets with key services of your company/organisation in a separate folder on the USB-Drive. Will get two free tickets for the conference sessions (18 – 21 June 2019) and the social event (19 June 2019). Will have the option to create additional tailor-made marketing events or activities in the overall context of the program (arrangements for this have to be made one month in advance of the event at the latest, any extra costs will have to be covered by the partner). Can order the exhibition package at a special Partner rate. Will have priority in choosing an exhibition booth location. Download promotional package order form (PDF/136KB).